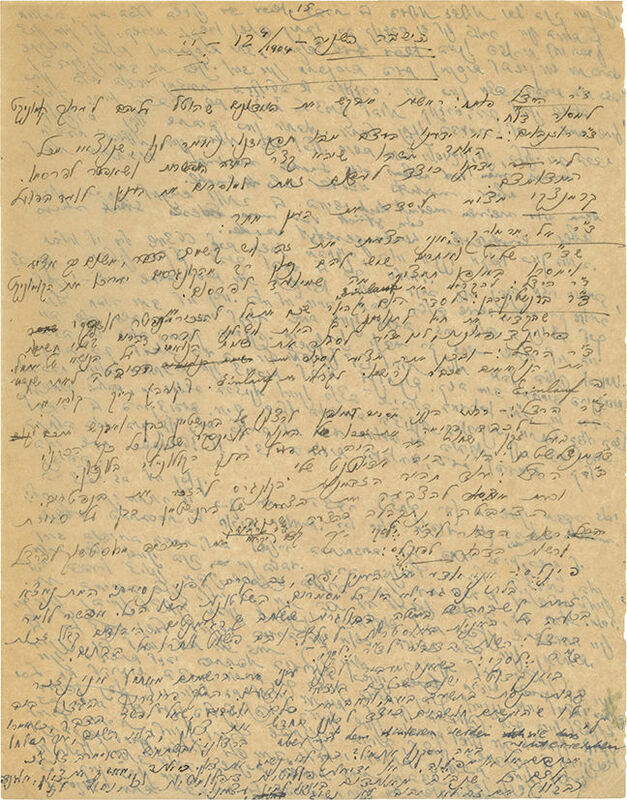 87 handwritten pages, with protocols of meetings of the Zionist General Council (Va’ad HaPoel HaZioni) in April 1904 – documentation of long debates between Theodor Herzl, Menachem Ussishkin, David Wolfson, Menachem Sheinkin, and others, about the Uganda Plan. [Vienna], April 1904. Hebrew and some German. In August 1903, Herzl submitted to members of the Zionist Congress the British proposal to establish a Jewish settlement in East Africa, which became known as the Uganda Plan. The proposal, which many delegates viewed as a renunciation of Zionism’s entire purpose, drew stormy reactions and led the Zionist movement to the brink of its first rift. Theodor Herzl led the supporters of the Uganda Plan, while Menachem Ussishkin led the opposition, which was comprised mainly of Russian Zionists. The dispute between both sides included exchanges of letters, public accusations, and even threats of departure by the Russian Zionists. In a last-ditch effort to prevent a rift within the Zionist movement, Herzl announced an emergency meeting of the Zionist General Council, which took place in Vienna from April 11 to April 15, 1904. These eighty-seven handwritten protocol pages record intense disputes, mutual accusations, and the agreement that was reached after four days of debate. The protocol contains, among other things, statements by Herzl (who led the meetings), Menachem Ussishkin, David Wolffsohn, Menachem Sheinkin, Jacob Bernstein-Cohen, Yehiel Chelnov, Zvi Belkovsky, Max Mandelstam, and Alexander Marmorek, among others. The first meeting was devoted almost entirely to Herzl’s long opening address, which lays out his position regarding Palestine and his reasons for supporting the Uganda Plan: "Here is a piece of bread. I, who perhaps have cake to eat, and in any case can always have a piece of bread, have no right to reject the piece of bread which is being offered to the poor because I don’t need or want it". Ussishkin's harsh remarks, made later on, are also recorded ("If you want war, by all means go ahead – there will be war. We will fight, and we will see who wins"), as well as statements of other representatives from both camps. The meetings also included discussions of other matters including financial affairs, the Jewish National Fund, the purchase of land, meetings with representatives of world governments, and donations for the planting of olive trees. The reconciliation meeting of the Zionist General Council is considered Herzl’s last great achievement for the Zionist movement. Herzl died three months later. 1-32, 35-47 leaves (87 written pages) +  appendix (strip of paper with a handwritten addition). Two leaves (no. 33-34) are missing; other pages from the end of the protocol may be missing as well. 24-33 cm (mostly 33 cm). Good condition. Creases and stains to some leaves (mostly slight), tears and open tears at margins (most are small and repaired).